The "Hyperion Highway" berthed at Sri Lanka’s Hambantota port on Dec 6, 2016, completed operations on Dec 7, and was to leave Hambantota, bound for Sohar Port in Oman, but was blocked by trade union dockers, and as of Dec 10, was still in port. Tugs and pilot could not reach the vessel, as dockers surrounded vessel with barbed wire, threw stones and on Dec 9 tried to climb aboard. The Navy had to intervene, in order to protect the vessel. The dockers were protesting against a Chinese firm, which was to take over the port including all staff. 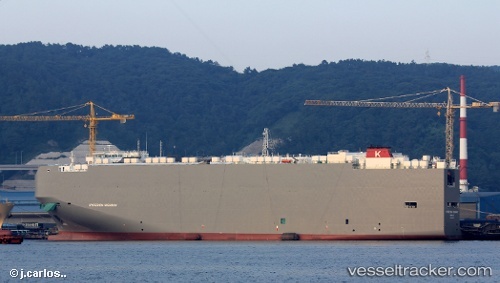 K ‘Line car carrier with a load of vehicles from Japan called at the Port of Hambantota recently. The vessel M/V ‘HYPERION HIGHWAY’ with an LOA of 199.5M and a cargo capacity of 7,700 units, discharged 523 units from Japan for domestic use.